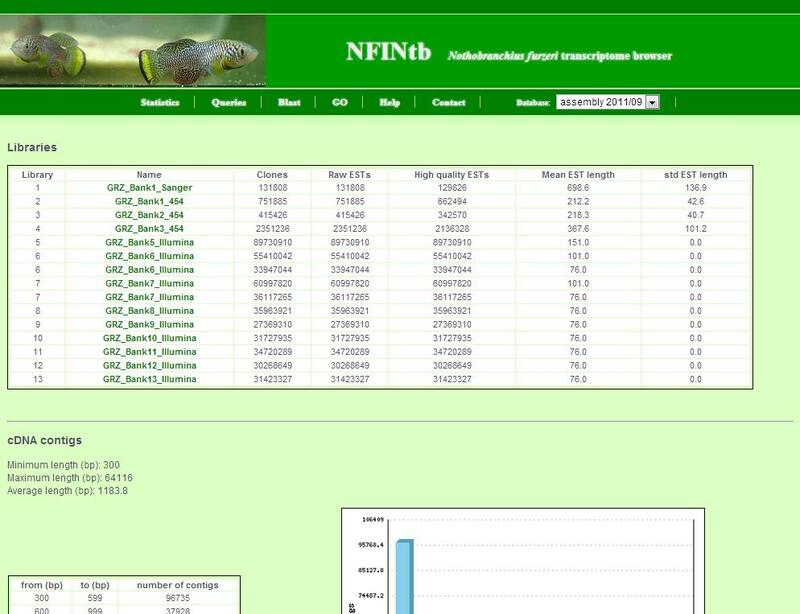 The NFINtb Nothobranchius furzeri Information Network transcriptome browser is a database of cDNA contig assemblies of the short-lived teleost fish Nothobranchius furzeri supplemented with the best currently available annotation. 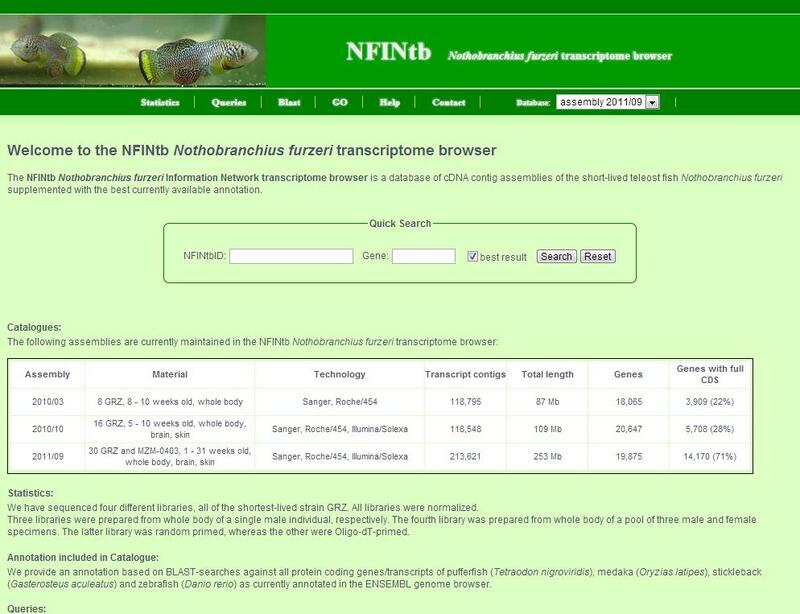 The NFINtb Nothobranchius furzeri transcriptome browser provides access to the annotated transcript catalogue, including detailed BLAST results, predicted protein domains, associated gene ontology terms, microsatellites and gene expression data. Further information includes sequenced libraries, distribution of contig lengths and annotation numbers, respective GO terms and corresponding transcript contigs is given. A query mask allows keyword (e.g. annotation, gene symbol, GO category) and BLAST searches by sequence similarity. N. furzeri sequences can be retrieved by batch download including annotation details. 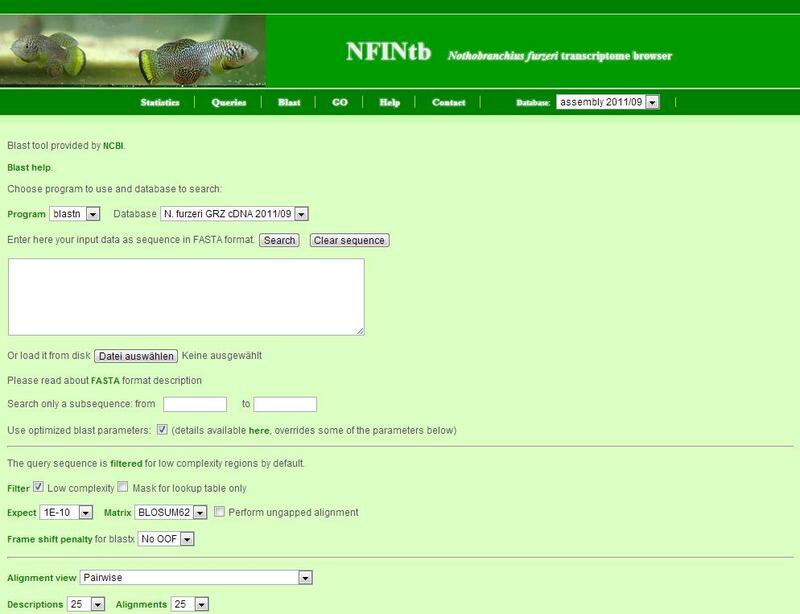 This page is shown when you enter the NFINtb Nothobranchius furzeri transcriptome browser or when you click on the logo. 1. First, choose the catalogue of interest. A table of all assembled catalogues is given further below. 2. Then, you can click on several links of the link bar to get the information you are interested in. A more comprehensive explanation of each pages follows. 3. Last, there is also a quick search field where you can search either by NFINtbID or by gene symbol. If you search by gene symbol, mark the check box to get only the best (longest) transcript contig per gene. The statistics page shows general information about the transcript catalogue. The query page provides an interface for complex queries to search the transcript catalogue. A phrase that is enclosed within double quote (") characters matches only results that contain the phrase literally. Example: "this is a example"
This page appears summarises the results of a search. Generally, it shows a number of transcript contigs as a table and provides tools to batch retrieve these. The number of retrieved transcript contigs. The table with transcript contigs: Each row contains NFINtbID, length, gene symbol, annotation and e-value of annotation. NFINtbIDs are linked to individual transcript contig pages. Gene symbols are linked to the NCBI Gene database. Also, as a side remark, e-values of unannoated transcript contigs are set to 1 for technical reasons. The navigation allows you to go the next page, set the number of transcript contigs per page and change the order of transcript contigs listed in the table. Sort criteria are NFINtbID, length, gene, annotation and e-value. 'Asc' means ascending and 'desc' means descending. Tools allow you to retrieve the set of transcript contigs as sequence file in fasta format or list file in csv format. 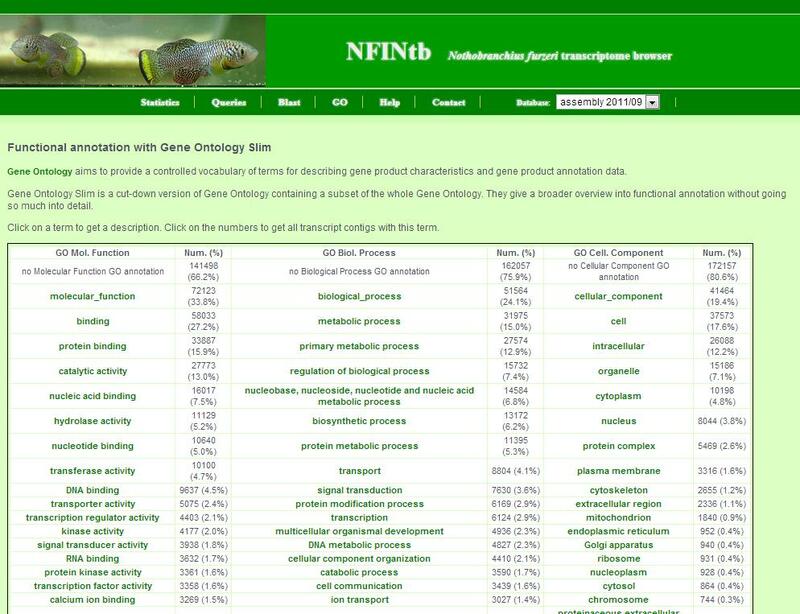 Further (yet inactivated) tools include the download of gene expression data, the download of corresponding zebrafish, medaka, stickleback and tetraodon orthologs and some basic functional gene enrichment analysis via babelomics. The BLAST server allows you to do similarity searches to find transcript contigs of interest. Sanger quality clipping Lucy 1.19p -error 0.02 0.015 -bracket 10 0.015 -window 50 0.08 10 0.3 -vector vector_db insert_sites Trims low-quality regions and remove remaining vector sequences in Sanger reads. Sanger and 454/Roche vector/contaminant/poly(A) removal SeqClean 1.0 -n 5000 -l 80 -v vector_db -s contaminant_db -N -L Trims additional vector and poly (A) tails in Sanger and 454/Roche reads, and removes contaminant reads. Sanger and 454/Roche low-complexity masking SeqClean 1.0 -n 5000 -l 80 -A -M Masks low-complexity repeats in Sanger and 454/Roche reads. Sanger and 454/Roche repeat masking RepeatMasker 3.2.9 -norna -xsmall -noint -qq -gccalc -lib nfurzeri_repeats Masks complex repeats in Sanger and 454/Roche reads. Solexa/Illumina read filtering SGA 0.9.12 sga preprocess --phred64 -p 1 -f 20 --dust Filters Solexa/Illumina reads for quality and low complexity. Solexa/Illumina error correction SGA 0.9.12 sga index reads;sga correct reads; Corrects obvious sequencing errors in Solexa/Illumina reads . Solexa/Illumina duplicate read removal SGA 0.9.12 sga index reads;sga filter --no-kmer-check reads; Removes exact duplicates in Solexa/Illumina reads. Solexa/Illumina/PAVE contigs reassembly TGICL 2.0 -l 100 -O '-d 30000 -f 5000 -p 90' Extends and joins contigs with relaxed parameters. Solexa/Illumina/PAVE - removal of redundant contigs CD-HIT-EST 4.5.5 -T 8 -c 0.99 -aS 0.9 -n 10 -B 1 -M 0 Removes highly redundant/overlapping contigs. BLAST Contamination screen WU-tBLASTx 2.0MP-WashU wordmask=seg W=4 T=999 hitdist=40 nogap V=25 B=25 Transcript contigs are compared against a contamination database. BLAST annotation WU-BLASTx,WU-BLASTn,WU-tBLASTx 2.0MP-WashU wordmask=seg lcmask W=4 T=20 (protein);M=1 N=-3 Q=3 R=3 W=15 wordmask=seg lcmask (nucleotide) Transcript contigs are compared against several protein and nucleotide database for annotation. Open reading frame (ORF) prediction prot4EST 2.0 BLASTx against NCBI nr, ESTScan with N.furzeri matrix, longest ORF Determines ORF in the transcript contigs that are translated to proteins. 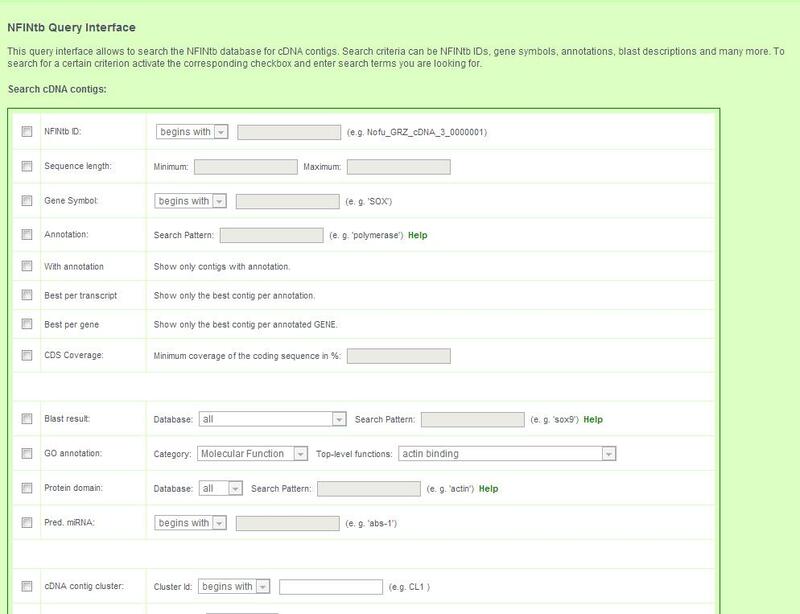 Protein domain prediction HMMER 3.0 default parameters Searches translated ORF for conserved protein domains. Orthologs in other fish species WU-BLASTx,WU-tBLASTn 2.0MP-WashU wordmask=seg lcmask W=4 T=20;wordmask=seg W=4 T=20 Transcript contigs are compared against proteins of other fish. Fish proteins are compared against transcript contigs. Best bidirectional hits are calculated. Sequencing data and assembly are online available in different databases. 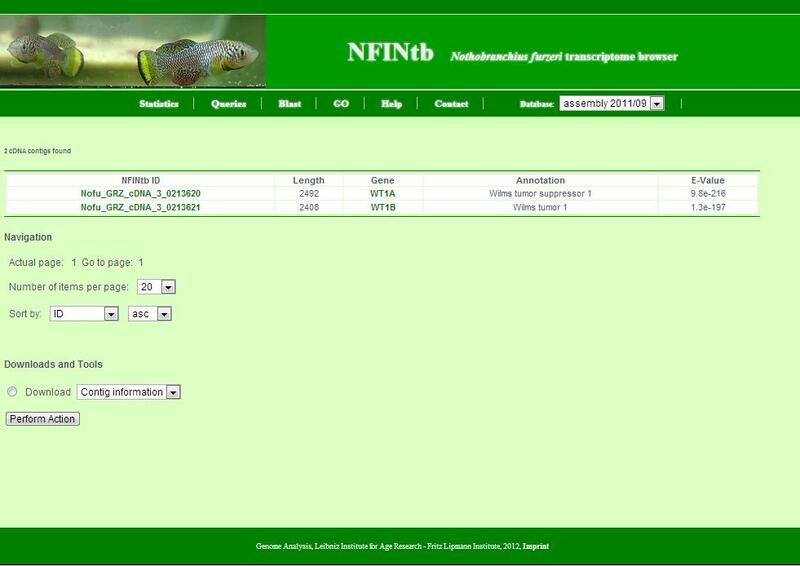 The NCBI BioProject page "Sequencing and assembly of the Nothobranchius furzeri transcriptome" (PRJNA85613) provides a good overview and starting point. 454/Roche and Solexa/Illumina data is also summarised in the NCBI SRA, study acession SRP010930. Note that TSA does not allow streches of Ns > 14. Therefore, such transcript contigs were split, and the parts were numbered accordingly. Moreover, since TSA only accepts contigs > 200 bp, some parts may not be submitted at all. Petzold A, Reichwald K, Hartmann N, Groth M, Taudien S, Shagin D, Priebe S, Englert C, Platzer M: The transcript catalogue of the short-lived fish Nothobranchius furzeri provides insights into age-dependent changes of mRNA levels. BMC Genomics 2013, 14:185. doi: 10.1186/1471-2164-14-185.